Man, I read this now and wonder why no one told us this as little girls and teenagers haha We would have saved a lot of time running after the boys 😉 Funny enough, at 30 years it makes more sense than ever. I think this applies to both personal and professional relationships. Why do we want to force anyone to be in our presence or care about us? I only want to be surrounded by people that genuinely want to be a part of my life because I somehow make theirs better and/or more complete. 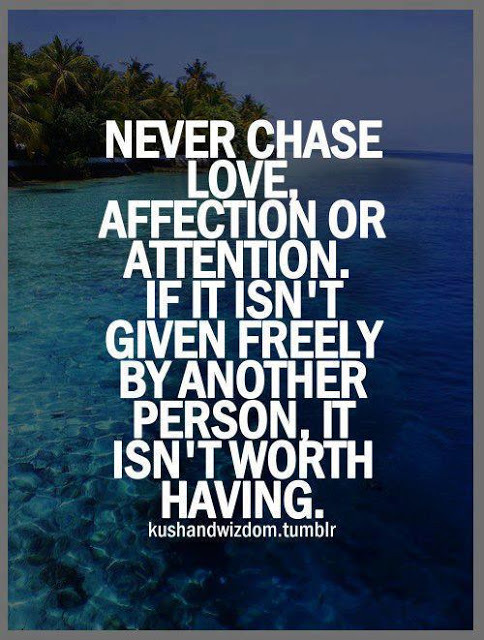 Forced love, affection and attention isn’t worth having, like the quote says. It’s just not natural and what isn’t natural is uncomfortable. Why waste this short life uncomfortable around those that don’t naturally want to give you what you need to make YOU better and more complete? Did you ever think that you are chasing love, affection and attention from others because you are lacking it within yourself? Hmm…I think that we need to spend more time and energy chasing within…loving ourselves, showing ourselves affection and giving ourselves much needed personal attention! We might just find that the answers to our own needs already lie within us, requiring no external chase at all.